If you are a frustrated gardener with no land with which to garden upon, there IS a solution that is not only fairly easy to implement but also so much fun you will be amazed. That solution does require utilization of some of those brain cells hanging around in your head (or the head of someone willing to help with the project). 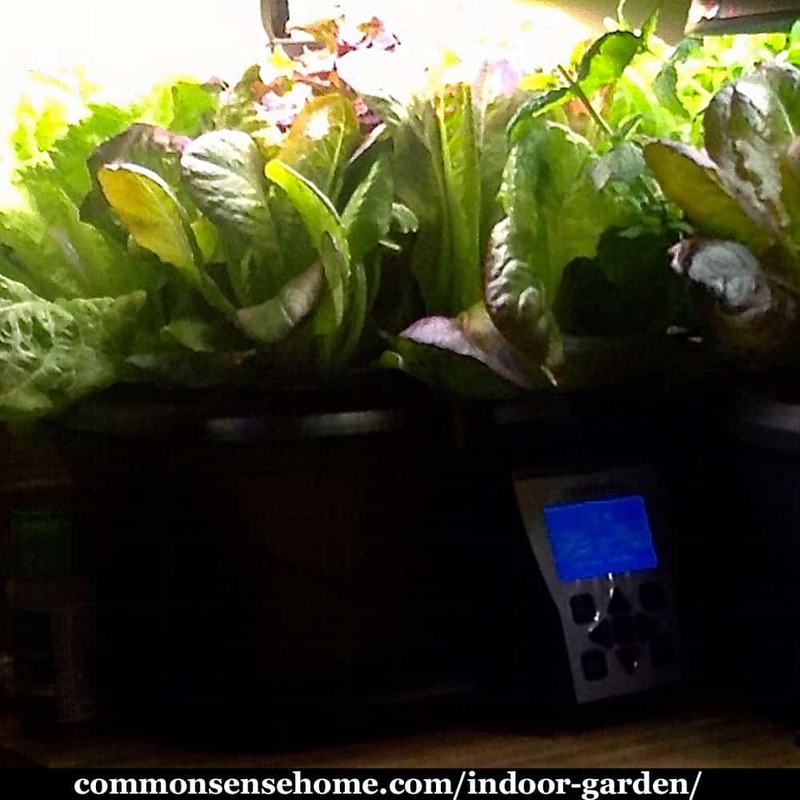 We are talking about having an indoor garden and raising not only healthy, organic fruits and vegetables, but raising enough of them to give your pocketbook a break. If you have a big enough indoor space, you might even be able to sell the fruits of your labor. For healthy people with tons of vitality and some land around their abodes, and indoor garden might seem unnecessary. Then again, those points might be helpful at a later time in life, or might be helpful for a friend or loved one in need. So why create your own private, abundant indoor garden? My own Inner Gardener was performing the mental equivalent of a temper tantrum and just wouldn’t shut up about it. Gardening options were fairly restrictive but I REALLY wanted a garden. First of all, there was the HOA rule of “no edible plants allowed in outdoor areas.” And, uh, there weren’t any “outdoor areas” in which one could plant a plant in. A tiny bit of patio before the front door and no back yard means container plants only. But the sun can be brutal in Arizona, so that is not a feasible option unless one is into cacti. Second, being in a shotgun-style condo with tiny windows only at front and back leaves the place dark enough to be considered a cave. (When it is dark enough to require a flashlight to walk around in the daytime if the power goes out, it’s a cave). Third, when the aforementioned condo is old and cheaply made by builders lacking any sense of style or storage options, there is not a heck of a lot of space in which to grow enough plants…or is there? Here’s a list of the best reasons to sow indoors; if your reason is here, this article is for you. When a bunch of cilantro goes from $1.49 to $5.99 in the space of a few months and one artichoke costs $14.99, it’s time to find a better way to get food. It seems like every little thing is around five bucks nowadays. When the money available barely pays the necessities (rent, utilities, medications, health insurance); that leaves little or nothing for frivolous items like food… and toilet paper. (But then, if there’s no food, there’s not much need for toilet paper.) Going to a local food bank can help, but it’s hardly what could be considered healthy. Even the soil for containers is expensive; it’s cheaper to go with hydroponics. Sometimes one experiences a personal health challenge that requires one to be much more careful with the diet, especially when there are allergies, a long or difficult recovery, or toxicities involved. An indoor garden can provide more healthy fresh food options. Given the poor soil quality that commercial farms have (since at least the 1930’s), indoor growing gives one the ability to put the proper nutrients into the food, for both improved health and flavor. We won’t even get into the chem-trail/geo-engineering crap being sprayed onto us and our crops. There are thousands of seeds available out there, including rare, heirloom, and organic types. There are also lots of organic live plants that can be ordered online, in whatever size and year of maturity desired. So, you want to make your own authentic mole` sauce but none of your local markets has the four types of chili peppers you need? You would think those would be easy to find in Arizona, but not in my area, and especially not organic—and peppers are one of the most heavily pesticide-laden crops in the world. Solution? Grow your own and roast and dry them yourself… and save the seeds for future crops. Gardening is a great hobby, with edible rewards. 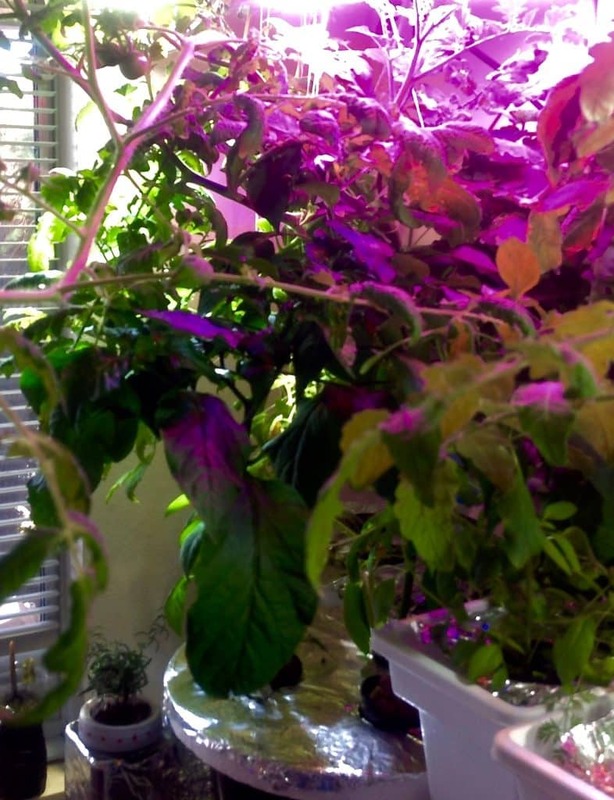 With an indoor garden, there are no seasons, so crops can be harvested year-round. Bringing nature indoors and working with it brings a sense of peace. See “Dirt Therapy – 8 Reasons You Need to Have a Garden” for more on how gardening improves mental health. There is no store-bought produce, even organic, that can match the taste of freshly-picked, nutrient-dense, home-grown organic produce. Strolling into the laundry room to pick a pile of Genovase basil leaves for pesto is so satisfying that it’s hard to relate to those who claim any bottled pesto is “fabulous”. There is no comparison to fresh. Picking a fresh California Wonder Red Bell-Pepper yields astonishment, as the taste is so far beyond what most of us consider to be a bell pepper. And the homegrown tomatoes… O…M…G. Outdoor gardening can be hard work, and it usually has to be done in a certain amount of time, “or else.” Indoor gardening can be set up for easy access, timing isn’t that critical, and temperatures can be maintained comfortably. For those who have the proverbial Green Thumb, growing seedlings for others can work well for all parties. Starting seeds hydroponically, indoors, grows ‘em up quick and strong and can give the grower a huge jump start for planting outdoors. Plants are beautiful. Some smell great, and the ones we want to grow are edible as well. What’s not to love about that? There are lots of edible flowers too; more bang for the buck. 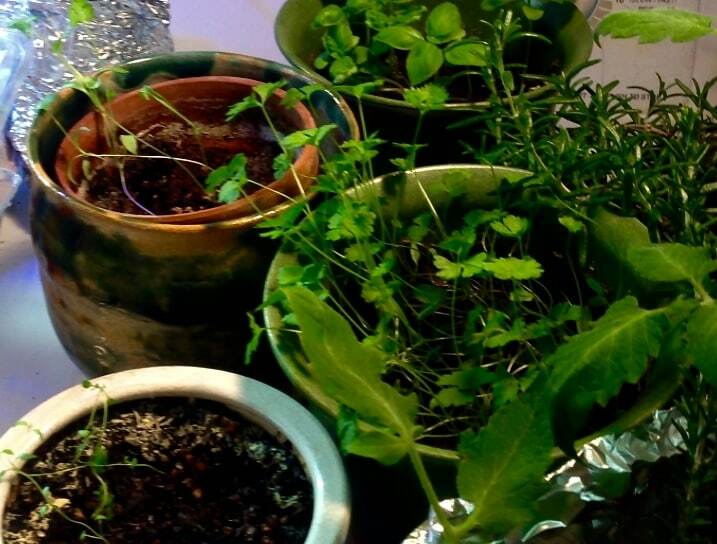 There are no seasons for indoor gardening, unless you decide to make some. Stagger the crops and there will be continuous harvests, so there’s no need to rush to preserve harvests. Choose the right plants, and the harvest stays on the plant until needed. There are usually fewer bugs that get indoors (unless you live in a barn and keep the doors open) and if there are some, there are some easy, non-toxic ways to get rid of them. The key is to BOLO (Be On the Look-Out) for them every day or so, and take immediate action. For those having a hard time believing how much food can be grown in tiny spaces, let’s just say I had more tomatoes, bell peppers, greens and herbs than I could eat and realized I should have staggered the growing! Here are some examples. Here's an overview of entire laundry grow area, on top of washer and dryer. Yes, those plants on the washer have to be moved to use the washer. 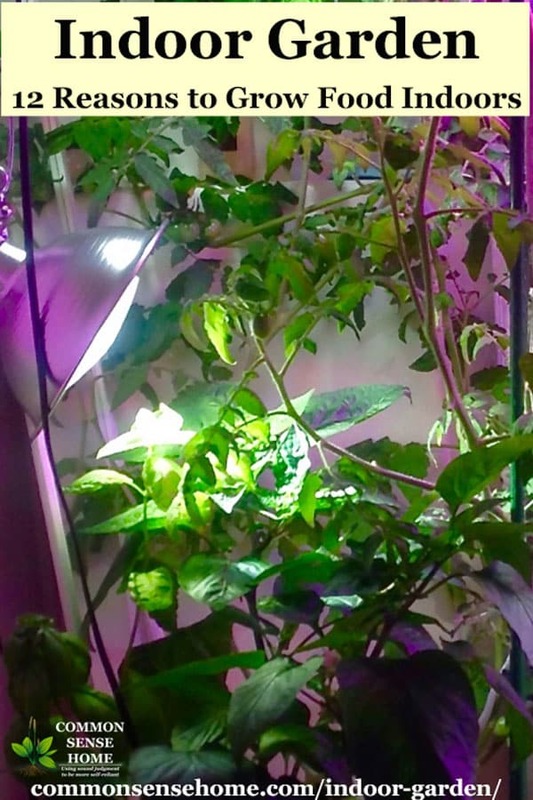 This is the nightshades tangle, on the dryer—tomatoes, peppers, tomatillos, with rosemary hanging out on the left and basil in the forefront. Here's the herb garden on the washer: catnip, basil, parsley, cilantro, bok choy. 2 AeroGardens, 7 pods each, had mint, kale, red romaine, crisp mint romaine, deers tongue, paris island, red malabar spinach, Bloomsdale long-standing spinach (all harvested). Current: 50 seed starts in one AeroGarden (will be transplanted elsewhere, with 7 lettuces and spinach to take their place of the GrowBowl, followed by a second AeroGarden about 45 days later). AeroGardens with lettuces, mint, kale, spinach. Left side of shower: catnip at bottom, basil on left, bell pepper in front, tomatoes and lettuce in back. Right side of shower: catnip and snowpea in front, tomatoes on right and back, bell pepper in front. And last but not least, in the over-crowded, narrow, tiny, dark living room. 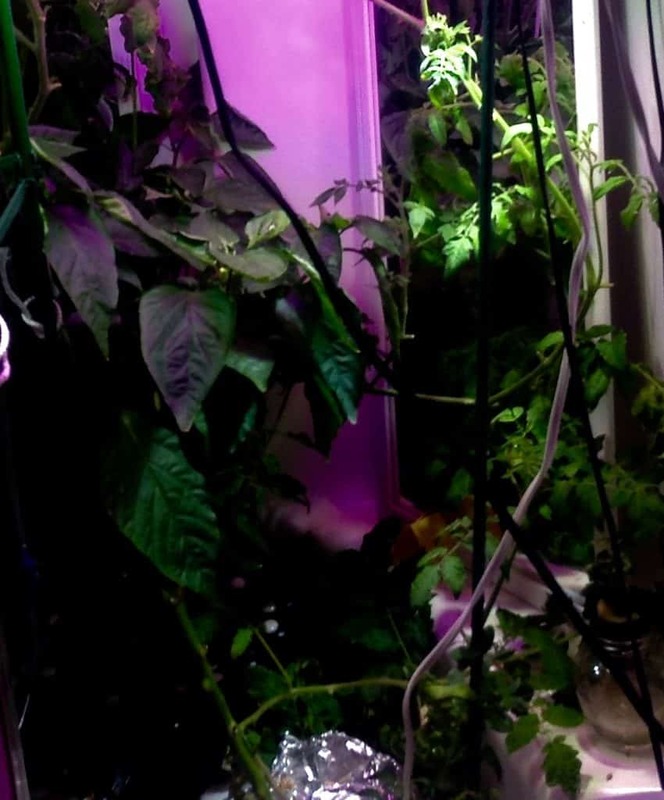 Where's the Best Spot to Grow Food Indoors? Even neat-freaks can grow an abundance of great foods indoors; it just takes a little planning and an eye for design. Tiny living rooms could hold a couple dwarf fruit trees and several containers of peppers, herbs, or whatever is desired. Something as simple as bok choy could make a striking display in a long, narrow box. Most visitors won’t notice the plants are food anyway, unless they are fruiting at the time. The main thing it takes for successful indoor gardening is light, the proper nutrients, and water. Even on a limited budget, good LED grow light panels can be found; fluorescent lights will do as well (including CFL bulbs). Future articles will contain references to the best deals I’ve found on seeds, LED’s, nutrients, etc. Where Can I Get Indoor Garden Supplies? 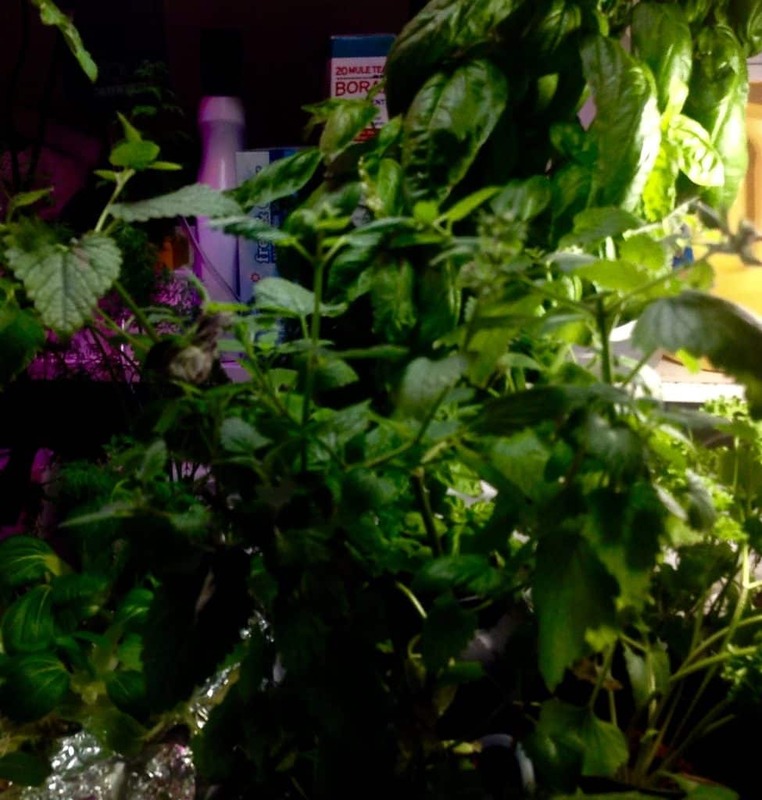 Do you have any questions about indoor gardening, or tips you'd like to share? Just leave a comment below. If you've enjoyed the article, please share it with your friends. 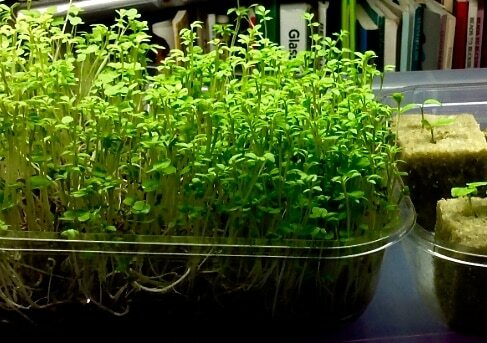 The next article in this series will feature “How to set up a Hydroponic Indoor Garden on the Cheap”. 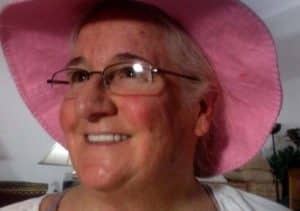 This is a guest post by one of our readers, Dr. Valerie Olmsted. Dr. Valerie Olmsted is a retired Naturopathic Physician with a passion for Nature and the proper functioning of the human body. Her love of Nature started in a big city, with daily trips to the beach, and eventually led her to venturing out into ocean, forest, jungles, and deserts, giving her an appreciation for the dualities of Life. When she decided another day without a garden was just not making her happy, she investigated hydroponic gardening and hasn’t looked back. Due to space constraints, she has found new ways edible plants can become decor as well as food, which she terms “cave gardening”; providing her plants with bees buzzing, bird songs and a gentle breeze during the day, and crickets and moonlight at night. Thank you so much for sharing your adventure. I didn’t realize such gardening existed. Please keep making guest posts, I love what you’re doing. With health issues I cannot garden outside very well but I love tomatoes and salads. This made me rethink my gardening options. Please keep up with additional information success and failures related to this topic! What an incredible garden! I do garden outside but I see such potential for starting an indoor garden now. Thank you for sharing.